A new week and the beginning of another new project. I don't keep track of the time spent on each piece.....it takes whatever the design/construction requires. Period! I can say however that a good 6-8 hours each day is average....till it's finished. Much of my work incorporates my hand-dyed fabrics. Time spent dyeing would be impossible to factor for each individual piece, nor honestly do I want to know! For instance, this piece began life as a piece of white silk noil. It was accordion pleated, secured with clips, dyed and then over-dyed in acid dye baths. 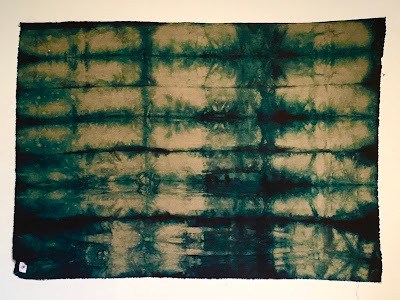 The dyed fabric reminded me of a murky marsh, so my thoughts were directed toward marsh plant materials. 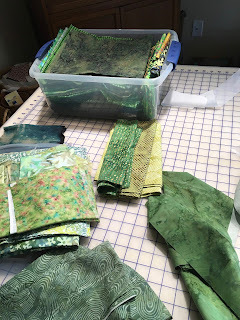 Naturally, out came piles of green fabrics. The design is being born. 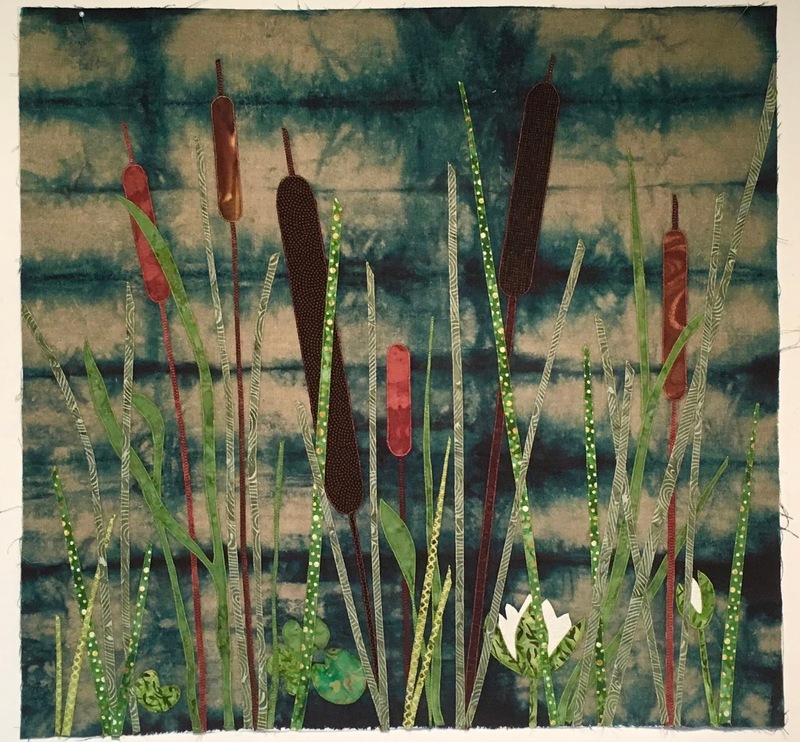 A number of years ago, I designed a line of trapunto stencils for Quilting Creations which I revisited for these cattail motifs. I'm simply playing with cut fabric on my design wall......lots of adding and subtracting, a normal process for me. The fused appliqué motifs will be finished with machine stitching. I'm very picky in regard to construction and had always preferred hand appliqué since it was tidier. My pal Linda Cantrell, known for her fabulous hand appliqué has now turned to fusing due to hand pain. 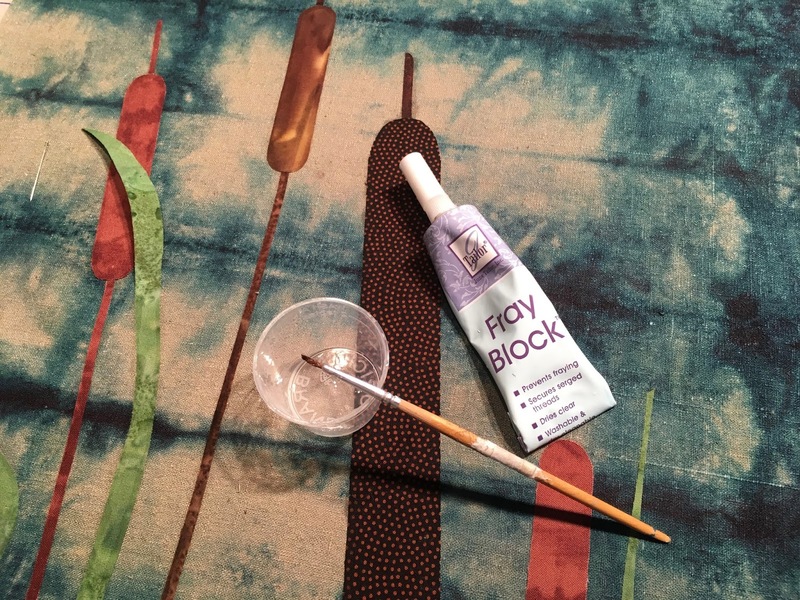 She introduced me on to 'Fray Block' to tame those cut fabric edges. 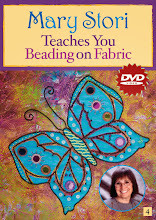 It can almost totally eliminate those unsightly threads that poke out after machine stitching. It doesn't stain the fabric as long as one follows the manufacturer's directions.....basically the tube is warmed in hot water for 10 mins. I like to apply it using a very thin paint brush. 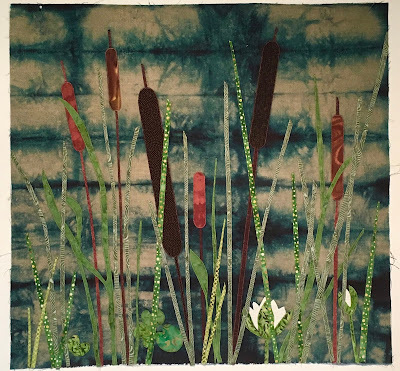 Because of all the layering of the grasses, the machine stitching was done in stages....here's a look after all the motifs have been secured. More soon when the piece is complete. Let's see what other artists have been working on this week, visit: Nina-Marie's Off The Wall Friday, Sarah's Whoop Whoop Friday, and Crazy Mom Sews. 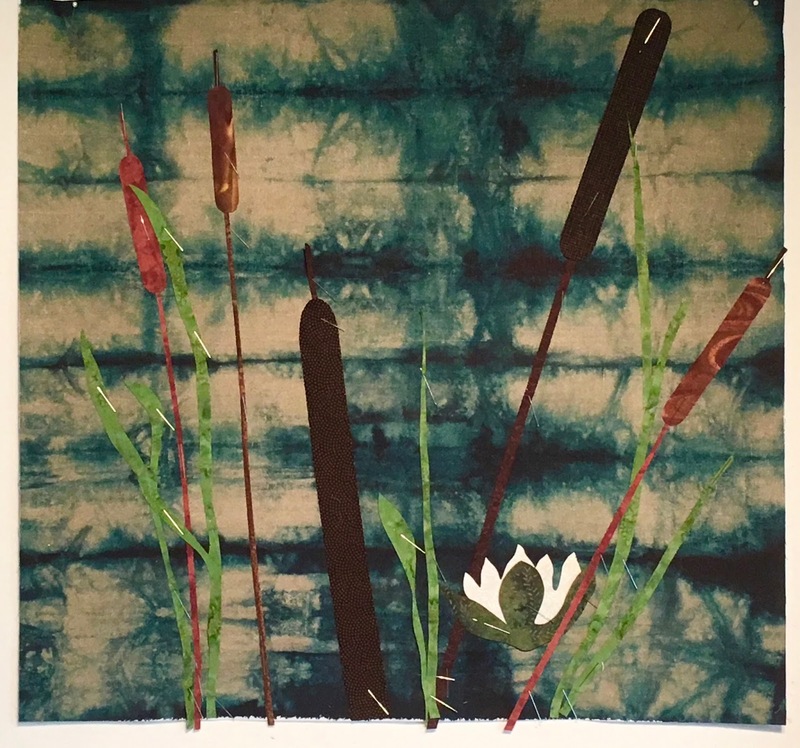 Love the way you incorporated the hand dyed Shibori piece with imagery....Yours is spot on! Looks like dappled sunshine right now. Can't wait to see what you add to it. As to time, you are absolutely correct...it takes what it takes! This is wonderful, Mary!!! WOW!!! Love it...never heard of Fray Block...only used Fray Check...will definitely check it out! Again, this piece is awesome!!! Did I miss where you designed trapunto stencils?? Tell us more about that!!! Inquiring minds want to know!! Wonderful. It indeed does remind me of the marsh that was on the farm that I grew up on. We played for hours in the valley and fished in the nearby creek. Beautiful Mary...and the cattails tell their story against the shibori in an exciting and contemporary way! Hooray! Can't wait to see the finish! Great use of the background fabric, I would have cut it up and pieced with it. Gorgeous art work. Love the colors. I hate it when people ask me how long did it take you to make it? I haven't the foggiest idea! It's not like I start a project and finish it 3 hours later. When is the last time you've finished a project in one day? Lovely start to the new composition.